Demonstrations in front of the Bardo museum,March 19, 2015.Demotix/ Hamideddine Bouali. All rights reserved.Wednesday, March 18, a few days before the Easter holiday for European and western countries, a jihadi attack struck in the middle of the capital of Tunisia. Because this action was perpetrated in an area in which the Parliament and the famous Bardo museum are very close to each other, it is not clear whether the jihadi strike was directed at the Taghout (the Tyrant in Quranic language) or at the tourists-Kafiryn (the western unbelievers). Independently of any original plan, at the end of the day the official death toll was of 23 victims, the majority of whom are foreigners. The first clue to understanding the dynamic and motivation behind the attack comes from the jihadis themselves. This is an official statement that appeared on the official Okba ibn Nafaa media website « Ifriqiya ». The second is a recorded audio statement made by the Islamic State, blessing the operation. The first communiqué was written in a very `strange` style, because very familiar in its language and formulation, describing the way the operation had developed and ironically addressing itself to those official Tunisian authorities and media that they supposed must be wondering about the « mysterious » dynamics of the operation. For those writing the statement, it appears this was just as simple as taking the metro, going past a police station in Bardo and entering the parliamentarians’ compound. A way of saying « don’t bother to dig deep for an explanation, it was just as simple as that ». The second ISIS statement was short and not in the form of a denunciation but rather a blessing conferred on the action that had taken place. These few elements give us some indication of the operation, and permit an attempt at analysis, albeit with a certain degree of caution. The first conclusion to be drawn is that the operation is likely to be coming from the group Okba Ibn Nefaa, a not very well identified katiba (brigade) of Al Qaeda in the Islamic Maghreb (AQIM). That would not be a surprise since the group has been in a declared state of war against the Tunisian state (Taghout) since at least 2013. We don`t know exactly the strategy of this group, but we can deduce some elements from experience, their communiqués, and initial security inquiries. It is indeed a jihadi group, very small in origin, located at the frontier between Algeria and Tunisia. Some sources believe this group to have emerged during and in the aftermath of the Azawad Islamic state in Mali. Composed mostly of Algerians, other nationalities had also integrated themselves into it after a while. It seems that the reason for participation in this group in particular was no more than the need to relocate after the defeat in Mali. According to security sources, the group had a role in helping with the logistics on behalf of those who wanted to go to Mali and who needed arms supplies for that purpose. By this reading, it is concluded that Okba Ibn Nafaa had very little or nothing to do with political developments in Tunisia. They seemed to be more concerned with trafficking with Libya, first and foremost with the smuggling of arms. 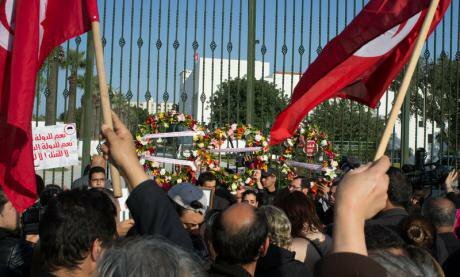 The extension of this group`s activities into Tunisian affairs seems to have evolved slowly in 2013, when questions were raised around the role of this group in political assassinations. The police were convinced that the organization had connections with jihadi cells in the most working class region of the country. This link made sense, since Tunisia was living through a major political change that had brought to the streets a vast number of disefrenchised youth, coming from neighbourhoods with similar characteristics. The political dynamics of transiton from one regime to another created the opportunity for a brand new salafi-jihadi group to impose itself on the scene, Ansar al-Sharia Tunisia (AST). The Interior Minister is convinced that no difference exists between this large disefrenchised population, Ansar al-Sharia and Okba Ibn Nafaa : they are all « terrorists ». The AST leadership, by contrast, insists in its declarations on emphasising its ideological conviction that Tunisia must be considered a land of preaching (dawa) and not of qital (fight). Abu Ayadh, the charismatic leader of the group, has added in several videos that between AST and the international jihadi movement there is an ideological link, but that this is neither political nor operational. This important difference has not been rnoticed by many observers, who have little patience with sophisticated distinctions between different Islamic or Salafi tendencies. But these distinctions have been and still are very useful, first and foremost because they give us a deeper understanding of the more general internal evolution of the international jihadi movement. The particular function of AST was to act as a social movement, looking at how to form a consensus between the disenfranchised masses. In its formation, it operated more like a typical Islamic group, i.e. focused on preaching and charity. So rather than adopting a typical Qaedist, apocalyptic vision and strategy, this group was interested in forming a group that could propose an alternative to the disastrous social conditions of large swathes of the Tunisian population (the same strategy was later pursued by Jabahat al-Nusra and Ansar al-Sharia Libya). This strategy was incredibly successful, to the point that, for many in Tunisia, it became an intolerable presence in society : too many young people were attracted to it. Soon enough, the annual AST Congress became the obvious target for the security apparatus to show it had a grip on the situation, backed by a significant part of the population scared of political violence, together with a politically anti-Islamist and nationalist elite. As a consequence, during 2013, a large grassroots, mainly Islamic movement was in existence and started to be convinced that all this evolving securitisation was the consequence of a return on the part of the old regime. An attempt was made to create an Islamic front against the `deep state`. Two starkly counterposing narratives were developing within the public debate, pitting those who called for a « war against terrorism » against their opponents who were eager to denounce what they saw as the risk of a return to dictatorship. It was the vacuum created by this polarization that Okba Ibn Nafaa and some new international jihadi developments were able to exploit. We must say that this scenario is both similar to and different from those in other countries of the region where authoritarian regimes fell in 2011. It is similar because a polarization process also went on in Tunisia, but different because the outcome was very different. While in Egypt, the so-called deep state or nationalist anti-Islamic camp has seized back power, and Libya has degenerated into a civil war without winners, in Tunisia a very interesting political experiment has been under way: mainstream Islamists (Nahda party) have refused the temptation of an Islamic front and instead joined a National Union government with nationalists. This deal has proven very effective, even in such very tense hours as those following the jihadi attack. However, those who rejected the deal and stayed on the sidelines continue to pursue a vision of reality in which the old regime has come back and is reintroducing its oppressive methods as much (or even more) than in the past. The proof they point to was the declaration that Ansar al-Sharia was a terrorist group made by the Nahda Government in August, 2013, without ever seriously attempting to include the movement in Tunisia’s political institutional landscape. This was exacerbated further by a repressive campaign launched against them. According to human rights organizations no less than 6,500 young people had been imprisoned as a result, twice the number incarcerated at the time of Ben Ali’s 2007 campaign of repression. After 2013, and AST`s blacklistng as a terrorist organization, the Interior Minister acted according to the logic that the numerous Salafist camp was one large homogeneous whole. AST was accused of being behind a terrorist campaign, even though this was never clearly proved. Most likely, confronted with such a crackdown, the Ansar Al-Sharia particular trajectory was brought to a close. But a large Salafist radical constituency remained in existence. One part of it went to Syria-Iraq and Libya ; another stayed inactive, fearing repression, and rejecting the reaction for political and practical reasons. Yet another faction tried to join those who wanted to mount some reaction against the government (most likely Okba Ibn Nafaa). Okba Ibn Nafaa has indeed been evolving in this context of radicalization, which encourages a confrontation between Salafists and the State. There is another hypothesis, to the effect that the evolution of the international jihadi scenario has eased the convergence of AQMI and the Islamic State. But this has not been proved and Tunisian security doesn`t seem to have the instruments of analysis to understand this complicated evolution of the situation, and more than it did during the era of Ben Ali (we are talking basically about the same apparatus). However, attacking tourists in Tunisia may be read as a new stage in the strategy of Tunisian jihadis, whether of Okba Ibn Nefaa or other disparate radical groups. Until now, in Tunisia as in Egypt, the attacks were directed towards the military and were aimed at seeking a consensus within the population. Attacking civilians is the begining of the end of any political strategy : it is not sure that this was entirely the intention (in their communiqué, the attackers are very careful to distinguish between foreign and Tunisian civilians : the latter being Muslims and not therefore a legitimate target) . Maybe this new stage was not part of the planning for the developement of the operation. Maybe the plan went awry. In conclusion, the jihadi threat in Tunisia is explicable on two levels : a first explanation points to typically Tunisian causes, not reducible to a generic and abstract « terroristic threat »; a second explanation is to be found in the entrenchment of the local within the international. The success of Islamic State has indeed changed the political situation. Exploiting the failure of the management of the political crisis throughout the region, the jihadis try to pull all the umma (the Muslims) over to their side in a general war between the Caliphate and its enemies, westerners and the region. While a real anti-terrorist strategy is necessary, because other attacks may be predicted in any of the many countries (Arab or western) involved in this clash of forces – nevertheless, it is vital that a separation is drawn between the international jihadi dynamics of the situation and the specific national crisis, that instead cries out for a political solution. For Tunisia, the jihadi strategy of attacking civilians (even though they are foreigners), risks triggering an even more violent escalation of violence. This is typically the result of a situation in which the jihadis have ended up becoming more and more isolated from the population (most Tunisians in a state of shock seem to back stronger, more repressive action). It would however be a grave mistake to give credit to the Tunisian Interior Minister’s strategy of a sum zero confrontation. It is not clear what a security reaction may achieve more than the arrest of yet more people without any clear link to violent action. A political solution will be needed sooner or later, which includes the political recognition and institutionalisation of a significant part of Tunisia’s Salafist movement.